Taranee is 13 at the start of the series. Her name originates from the Hebrew word 'Tara' which means 'palm tree'. 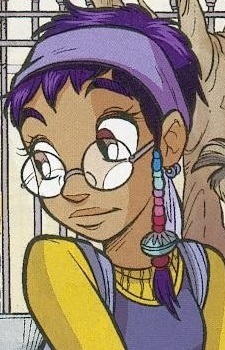 She may be shy and laid-back, but Taranee can be very determined when she sets her mind to a goal. Out of all her friends, she is usually the one that has to remind every one about an important task at hand. She was a new student to Heatherfield along with Will and the two became best friends due to that. She is the fire guardian and can control fire at her will. She can produce heat waves, read minds, and can communicate with people telepathically. Her theme varies from red to orange and her symbol is a red triangle with a corner opened.